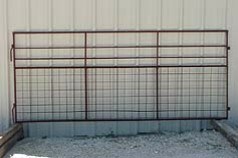 4 ft. tall with 4" x4", 6-gauge galvanized wire mesh at the bottom.All portable panels are constructed of 1-1/4" pipe frame with 3/4" or 7/8" rails. Constructed of 1” square tubing frame with 4x4 6 ga. welded wire panel. Raw metal frame, no paint or primer.